Boil water in a pot. Add milk and a pinch of salt. Add the shredded carrot, cinnamon, nutmeg, ginger, maple syrup, and 2 tablespoons of raisins (this is about half of the raisins). Reduce to medium-low eat. Cook the oatmeal on low heat for 4-5 minutes or until most of the liquid has been absorbed. Turn off the heat. Cover the pot and allow the oatmeal to rest for another 2 minutes, or until all of the remaining liquid is absorbed. Remove the lid and add the remaining maple syrup, raisins, and vanilla. Serve the oatmeal in 2 bowls immediately. Add chopped walnuts to taste. Sprinkle some shredded coconut as garnish and to intensify the flavor of the oatmeal. Start your day with a sweet bowl of oatmeal that will make you feel as if you were enjoying a delicious slice of carrot cake for breakfast. 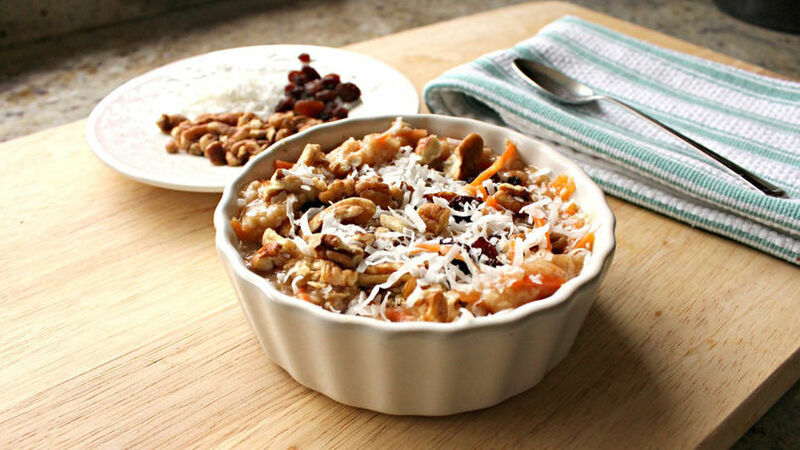 Enjoy this simple and delicious recipe for Carrot Cake Oatmeal. I hope you like it!